The World Health Organization has firmly set its sights on the anti-vaccination movement. In a post this week, WHO listed vaccine hesitancy as one of the world’s top health threats to combat in 2019, right alongside other major problems like HIV, Ebola, and climate change. The new inclusion (it wasn’t on WHO’s 2018 list) is the latest recognition of how dangerous the antivax movement has become. Cases of measles rose 30 percent globally between 2016 and 2017, for instance, according to WHO. This rise in measles isn’t entirely the fault of antivaxxers (lack of accessible healthcare is another reason), and overall rates of vaccination still remain high in countries like the U.S., where it’s long been a mandatory requirement for children entering the school system. But the movement has sown enough doubt to create pockets of unvaccinated people where the highly contagious disease can spread like wildfire. The state of New York, for instance, is facing its worst outbreak of measles in decades, with more than 170 cases reported since September and another 33 cases in nearby New Jersey. Almost all of these cases have occurred among the minority of ultra-Orthodox Jewish people who have shunned vaccination, and they likely bought the virus back from Israel, another country dealing with outbreaks of the virus, according to the New York State Department of Health. The U.S., thanks to mandatory vaccination, has been declared free of native measles cases since 2000. 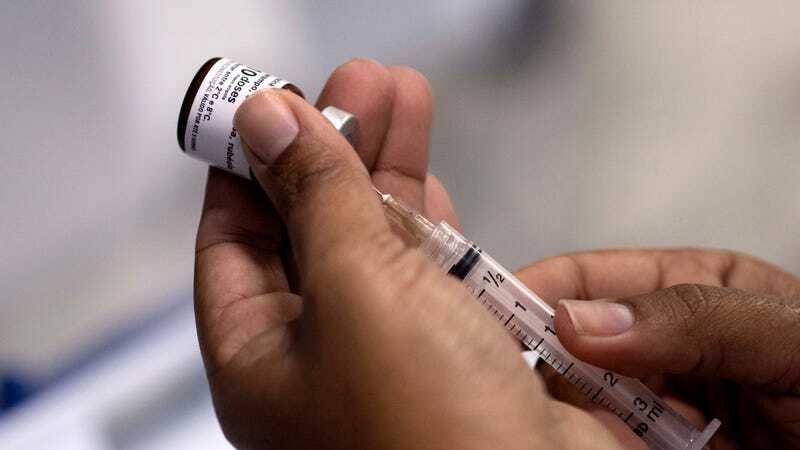 “Vaccination is one of the most cost-effective ways of avoiding disease—it currently prevents 2-3 million deaths a year, and a further 1.5 million could be avoided if global coverage of vaccinations improved,” the WHO post said. On the bright side, yet another public health triumph fueled by vaccination is close to fruition. In 2018, WHO reported, there were fewer than 30 cases of wild polio scattered in two countries, and the organization hopes that 2019 will see the final push needed to stop its transmission completely. This will certainly be a victory worth celebrating, as polio is a devastating disease that once killed or paralyzed half a million people, often children, worldwide every year. The other 2019 health threats highlighted by WHO include non-communicable diseases like diabetes and cancer, a possible flu pandemic (reminder: get your flu shot), living conditions like famine and war that make people especially vulnerable, antibiotic resistance, weak health care systems, and the mosquitoborne Dengue virus. Climate change and air pollution also made the list: Between 2030 to 2050, WHO reported, it’s expected that climate change will cause 250,000 additional deaths per year, due to an increase in problems like malaria, heat stress, malnutrition, and diarrhea.